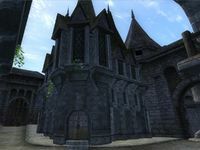 Toutius Sextius' House is an upper-class home located in the northeastern part of Skingrad, just west of the east gate. The house is situated across from Summitmist Manor. It is the residence of Toutius Sextius and contains two zones, Toutius Sextius' House and Toutius Sextius' Basement. Toutius' house reflects his upper-class lifestyle. Upon entering, to the right is a spacious room filled with furniture and upper-class dishes. A table holding two apples, two strawberries, an orange, some silver dishes, and a copy of Gray Fox, Man or Myth? is located to the right, on the west wall. A set of drawers containing clutter displaying some silver items is situated beside the table. Almost the entire south wall is lined with china cabinets containing a large selection of silver and ceramic dishes. A steel helmet can be found on the shelf of the left-hand cabinet. A cozy fireplace along with two chairs is on the east wall. Two smaller cabinets are located beside the fireplace. The cabinet in between the fireplace and the door leading to the basement contains two bottles of Surilie Brothers wine, a small selection of books, and an assortment of silver dining ware. A folded cloth and another bottle of Surilie Brothers can be found on top of this cabinet. 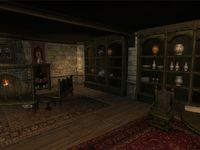 The other cabinet beside the fireplace holds a larger selection of books, most notably The Argonian Account, Book 4. A silver urn rests on top of this cabinet. The second floor of the house greets you with two unlocked chests that both contain clutter. A set of drawers containing clutter can be found in the eastern part of the second floor, located fairly close to the stairs. In the vicinity of these drawers is a cabinet containing some books, dishes, and a set of scales along with a cupboard containing some clutter. Near the balcony overlooking the entryway are two chairs and a small table holding a bottle of Tamika Vintage 415 and an accompanying silver goblet. 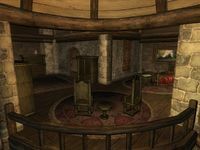 To the right of the stairs leading to the third floor is a chair and a set of drawers containing clutter and the books Guide to the Imperial City and Guide to Skingrad found on top of them. Hidden behind these drawers is a locked jewelry box on a windowsill that may contain some expensive jewelry. After climbing up the steps to the third floor, you will immediately see a set of drawers that contain clutter along with a locked door to your left. Behind this door is a bedroom befitting an upper-class citizen. As soon as you enter, a set of drawers with a silver urn on top of them is located to your immediate right. The bottom set of drawers contains a selection of clothing while the top set contains clutter. To the right of this set of drawers is a chair and a desk containing some books with a few silver dishes on top of it. A pair of blue suede shoes and a chest containing clutter can be found beside the desk. Between the two chairs near the balcony and the chest are two parallel cupboards that both contain clutter. More notably, a locked jewelry box is placed on top of the eastern cupboard. In the southwestern part of the room you will find Toutius' double size bed with a locked chest containing gold and a chance of jewelry at the foot. A green brocade doublet and a green silk garment are on top of the chest and a pair of green velvet shoes are placed beside the chest. A nirnroot is displayed on a nearby windowsill. 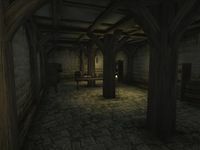 Shortly after entering the basement, it becomes apparent that Toutius uses it for storage. After heading down a short series of steps, you will find yourself in the main part of the basement. A cupboard and two sacks that all contain clutter along with a grain sack are located to your immediate right. A table can be found in the northwest corner of the basement with three ears of corn, some lettuce, and a selection of pewter silverware located on top of it. South of the table is a shelf holding an assortment of pewter dishes with a barrel containing food and a broom situated beside it. In the southern part of the basement is another table holding two cheese wedges, a loaf of bread, and a few more pewter dishes. Two garlic clusters hang above this table. East of the table is a food cupboard and a cabinet displaying more food, including two loaves of bread, two ears of corn, and a pumpkin. Directly south of the table are two barrels containing food situated beside a candle. West of the table and to the left of the barrels is a shelf displaying a selection of silver items. The key to the house is carried by Toutius. The jewelry box in his bedroom is non-respawning, and therefore safe for storage. Esta página foi modificada pela última vez à(s) 23h44min de 27 de junho de 2015.